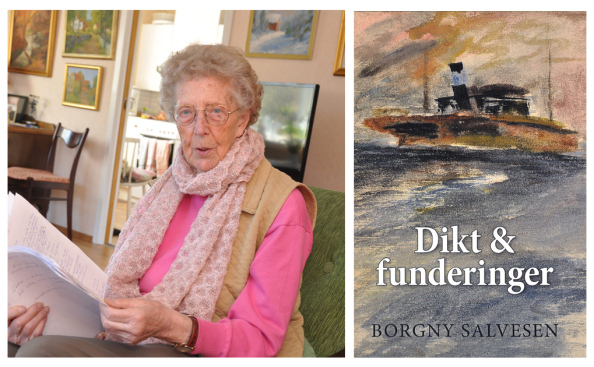 To those of you who are dreaming of becoming a published author but feel that you are becoming too old: Borgny Salvesen (90) is nominated for Southern Norway’s Literary Award 2015 for her debut book “Poems and ponderings”(Norwegian: Dikt og funderinger”). Borgny Salvesen from Vennesla municipality in southern Norway has throughout her life written short poems and ponderings. Her debut book, published by Vennesla Libris, contains about 70 poems and paintings by the author. The poems are written in local dialect, and the verse form is unique. The 90-year-old is nominated in the fiction category. The prize is awarded for the 15th time and the premise to be considered is that the author is a resident of Aust-Agder or Vest-Agder counties or comes from Southern Norway. The jury feels that the book stands on its own because it conveys reflections of events and a lived life in a language that makes it understandable for large groups of readers. Its religious undertone is no weakness, but rather a strength, because it challenges us as we face the great questions of existence.